The demand of products is expanding at the time of purification of water by quality of its corrosion restraint property combined with expanding natural and atmosphere concerns and populace growth. The American Water Works Association supports sodium silicate utilized for controlling erosion in municipal water. Moreover, BASF SE, one of the major companies in the global sodium silicate market, has begun another manufacture line of Ultrasion in Yeosu, South Korea for purifying of water. As stated by the TMR report on the global sodium silicate market was valued at US$4.9 bn in 2016. The global market is projected to grow at a stellar 1.92% CAGR in the forecast period of 2016-2025 and reach US$5.81 bn by 2025. Based on application, the global sodium silicate market is segmented into silica manufacturing, detergents, chemicals & catalysts, paper pulp & board, water treatment, construction materials, and soil stabilization. These categories have been studied based on current and forthcoming trends. Asia Pacific is projected to lead the global sodium silicate market. Also, this region is expected to record the maximum CAGR in the forthcoming years. This is owing to the existence of numerous detergent producers in the economy. Among the region, China is projected to gain the maximum revenue share of the global sodium silicate market in the forthcoming years. Expanding utilization of sodium silicate in detergents because of good, emulsifying, and high buffering force is driving the demand of the sodium silicate market. Moreover, rising wellbeing awareness among the buyers combined with expanding per capita income is impelling the development of sodium silicate market. Developing interest from the material business for manufactured cleansers, wetting specialists, and cleansers are driving the market development. Developing paper industry as a result of expanding utilization of paper towels, tissue paper, and the layered board is driving the sodium silicate market development. Sodium silicate request is impacted by its utilization in blanching and covering of reused items. Moreover, the administrative principles set by the legislatures to utilize recyclable items regarding lessening ecological issues are invigorating the item request. Sodium silicate utilization in the construction sector is expanding due to protection from high temperature and water. Additionally, utilization of sodium silicate is growing in tire producing because of abrasion resistance. These factors are driving the sodium silicate market. The essential restriction in the development way of water glass market is the unsafe impacts of sodium silicate. High human contact of the sodium silicate will make some genuine harms the human wellbeing. In addition, value changes of various types of sodium silicate, combined with the existence of different substitutes may hamper the market development in the forthcoming years. 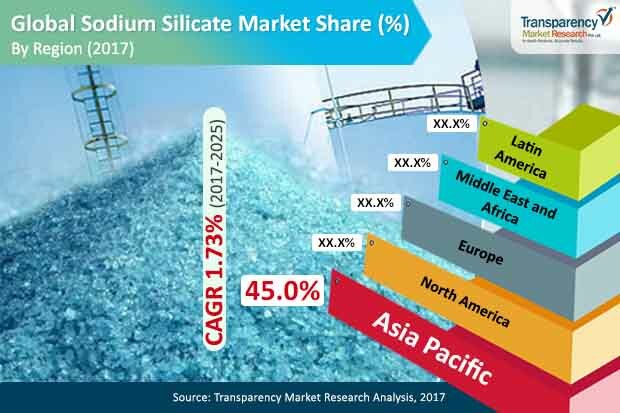 Nonetheless, the rising per capita income and growing awareness about the cleanliness and hygiene will drive the sodium silicate market in the upcoming years.